GARY – The debut of the Indiana University Kokomo men’s basketball program turned out to be a stunner. The unheralded Cougars – who are only playing as a club team this year as it waits for admission into the NAIA level – traveled to the Steel City and shocked the Indiana University Northwest Redhawks, 82-76. While IUK head coach Jace Thompson knew his team would find some success in its inaugural season, he wasn’t sure it would come this early. IUK showed no signs of being an inexperienced team, and in fact, started strong. Three minutes into the game, the Cougars led 9-8 and held that lead for nearly seven minutes. Once the Redhawks grabbed a 19-17 lead, it looked as though they were ready to run away with the game, especially after they opened a 34-26 advantage. But tough play by the Cougar defense – specifically Brandon Larrick crashing the boards – allowed IUK to score eight unanswered points to tie the game at 34 and go into the halftime locker room down by one, 37-36. The Cougars jumped right back into the lead early in the second half, and led 45-40 at the 16:00 mark after a Graves three-pointer. But again, the Redhawks showed its maturity and reclaimed the lead after a 6-0 run – and from there the two teams battled until IUK grabbed a 70-69 lead on a Jared Lawrence drive with 4:45 left in the game. That would be the final lead change as the Cougars controlled the tempo of the final five minutes, hit clutch free throws (28-39 for the game), and walked away victorious for the first time in the programs young history. Anthony Graves led the Cougars to victory with 31 points and 12 rebounds, while freshman Brandon Larrick added 10 points and 12 boards and Aaron Knupp 12 points for the winners. IUK stays on the road for two more games – at Calumet College of St. Joseph on Nov. 4 and St. Francis of Chicago the following day – before kicking off its home campaign at Western High School on Nov. 12. The Cougars will host Indiana Dabney University at 2 p.m. 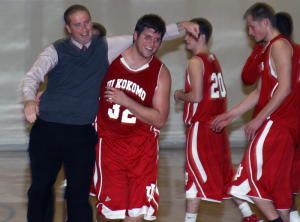 This entry was posted in Basketball, Cougars, Indiana, Indiana University, IU Kokomo, IUK, Kokomo, Uncategorized. Bookmark the permalink.